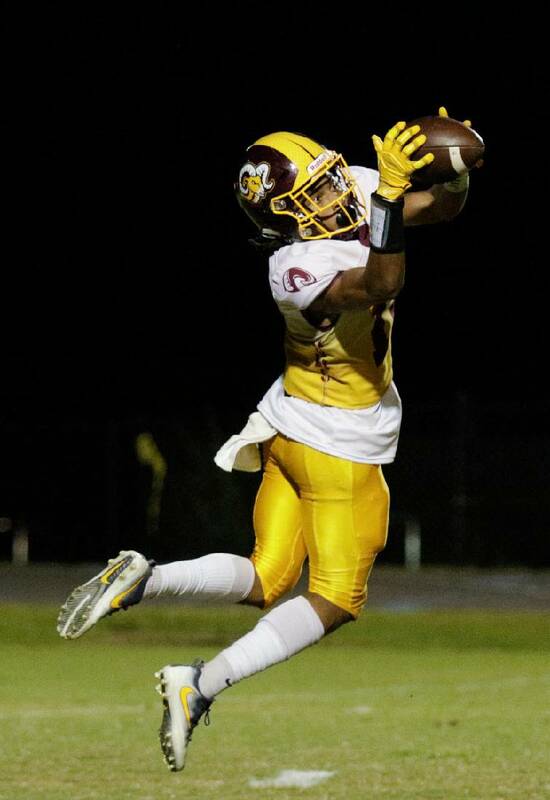 Tyner junior receiver Jeremiah Batiste has 1,178 yards on 49 catches with 15 touchdowns this season, and he has helped the Rams reach the second round of the Class 2A state playoffs. Wayne Turner is not easily impressed. With more than four decades of experience, including 30 years at a prep program that routinely produces college athletes and state playoff runs, the veteran football coach recognizes that what would be considered spectacular at some places is simply routine at Tyner Academy. But less than an hour into Monday's practice, as the Rams began preparing for their second-round playoff game against Trousdale County, junior receiver Jeremiah Batiste left his head coach and everyone else on the field in awe — momentarily speechless at what a special talent he is. As Batiste slanted full speed across the defense, a pass whizzed slightly behind him and should've continued sailing before skipping across the damp grass, incomplete. Instead, the 6-foot-1, 180-pounder reached behind his head and snagged the ball — one-handed — before bringing his arm down to cradle the ball against his chest, all without breaking stride. The typically gruff Turner turned to assistant Greg Hale, laughed and said, "Whoa! How about that? Can you believe that kid?" After making several similar catches to help Tyner reach the Class 2A state championship game last season, Batiste has now become the team's most dynamic and consistent offensive weapon. "He's the guy who ignites our whole offense. He makes us go," Turner said. "We've got several other guys who can make big plays for us, but when Jeremiah scores, it ignites the whole team because of the energy he brings back to the sideline from the end zone. "It might not be the first play that's going to him, but you better believe somewhere in that first series I'm calling a play to go to him, because when he scores our whole team gets up and plays at the level we need to. Athletically he rates right up there with the best we've ever had here, but what really separates him is his willingness to outwork everybody else, too." Recognizing the kid's potential, Hale went to Batiste during the offseason with an ambitious workout plan that would require months of dedication and sacrifice. Since moving to Chattanooga from New Orleans with his mom and sister prior to his freshman year, Batiste had returned to Louisiana to visit family each summer. But last spring, after running a time of 10.86 seconds in the 100-meter dash at the state track meet, Batiste agreed to stay in Chattanooga for Hale's grueling workout program. "I'm really close with my granddad back home and he's battling cancer, so it was really tough for me not to go back to see him and my other family," Batiste said. "But after the season we had last year, when I told my family down there that I was thinking about staying here to work out all summer, my granddad was the first one who told me to do what was best for me and my future. "That meant a lot, so once I started the summer workouts my family was my biggest inspiration. I believe God made a way for me, because I'm doing things here that I don't know I'd be doing down there. I always want to be the one to set things off — to ignite the team and give them something to feed off of. The only way I know to get to where I can do that is to just work every day." The extra work he put in during the offseason — three daily workouts that included running in sand pits to strengthen his legs, catching tennis balls, lifting weights and running endless sprints — has paid off in statewide recognition as well. He was named a Mr. Football semifinalist last week, a rarity for a receiver for an award that typically is dominated by quarterbacks and running backs. Going into tonight's home game against Trousdale, Batiste leads the area with 1,178 yards on 49 catches with 15 touchdowns to help the Rams average 40 points during the 10-game winning streak they're currently riding. His college recruiting also has picked up, with serious interest from Appalachian State, Georgia Tech, Iowa, Kentucky, Middle Tennessee State and Tennessee among others. "What speaks volumes about Jeremiah is that he's got ambitions and goals," Hale said. "You can see a lot of natural, God-given ability that other kids don't have, but when I asked him last year how good he wanted to be, he didn't hesitate to tell me he'd do whatever we asked to make him the best player he can be. "He doesn't really go out at night or goof off like most kids his age. I've never seen a kid so locked in and dedicated. When you take his ability and combine it with that type attitude, he's separating himself to be something really special."